Sikinos belongs to Cyclades Cyclades and it is located between the islands Folegandros and Ios. It is a small and dry mountainous island with long narrow shape, on which the longest route is merely 8 kilometers. Sikinos is a quiet island for people who seek relaxation and tranquility. 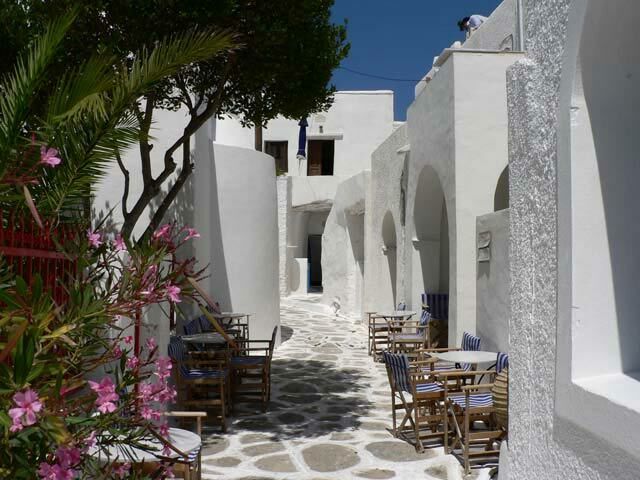 Sikinos has managed to preserve its traditional character, without being altered by tourism. 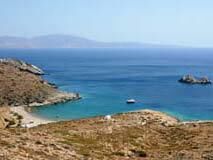 There are only two settlements on Sikinos, Chora and Alopronia, where the island's small harbor is found. Sikinos does not have many beaches and in addition to that only three are accessible by road. However, the hospitality of the locals, the scenic Chora with the great view and the traditional flavors will more than make up for that. On Sikinos you can buy exceptional local products like honey and wine which is expected as the ancient name of the island was Inoi (=wine land) and its ancient coin had a bunch of grapes on one side and a bee on the other. On Sikinos there is a gas station and an ATM machine. Only 3 beaches can be reached through the road, Alopronia, Agios Georgios and Dialiskari. You can get to the rest of the beaches either by paths which require a lot of walking or by boat that depart from Alopronia. Agios Panteleimonas (Southwest Sikinos): A small quiet beach with sand but difficult access. Agios Giannis (Southwest Sikinos): A small beach in a protected bay with pebble and crystal water. Santorineika (South Sikinos): Two small beaches with pebble and turquoise sea. Agios Georgios (Northeast Sikinos): One of the most popular beaches of Sikinos with nice blue sea and few tamarisk trees. Maltas (Northeast Sikinos): A beautiful desolate beach with clean blue water, light sand and pebble. 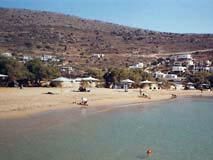 Alopronia (East Sikinos): The most central beach of Sikinos with nice sand and tamarisk trees. 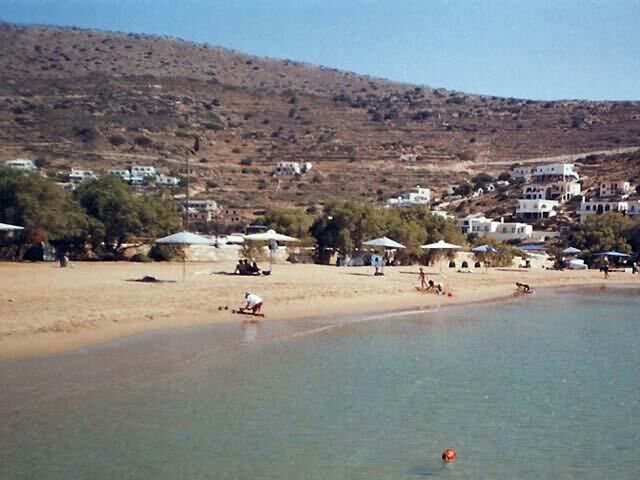 Dialiskari (East Sikinos): Α quiet beach with sand, clean sea and tamarisk trees. It is a 7 hour trip from the port of Piraeus to reach Sikinos. Sikinos is a small island with an even smaller road network of merely 8 kilometers that starts from Alopronia where the harbor is, passes through Chora and ends up in Episkopi. For your transportation on Sikinos you can use the bus which goes on that exact route and passes frequently. There are boats leaving from Alopronia for most of the island's beaches that do not have road access. There is no taxi on Sikinos. You can find accommodation on Sikinos either in Alopronia or in Chora, so you have to choose which one you like best. If you stay in Alopronia you will have the main beach of Sikinos one breath away, but it pales in comparison to Chora when it comes to beauty and view. The distance between those two villages is only 4 kilometers, so if you have your own transportation it does not really matter where you stay. Some of the traditional dishes of the Sikinos are stuffed lamp in the oven, the string beans (local beans) and the salad with the local capers. You should try the cucumbers of Sikinos, as it is a unique variety with round shape and exquisite scent. For dessert you can try the pasteli (cereal bar with honey) with orange and almonds, and the diagkourenia (watermelon with dough and sesame). On Sikinos you can buy traditional local products like olive oil, superb thyme honey and dairy products (xinogalo, myzithra and Sikinos cheese). You can also get excellent wine for which Sikinos has been famous since the ancient times, as the ancient name of the island was Inoi (=wine land). It is worth getting a candle as a souvenir, as the candles in the island's churches are handmade, without any chemicals, thus having a fantastic smell. The scenic Chora of Sikinos is made up of three separate settlements, with most shops in Kastro. Episkopi was built using the original building, the Roman mausoleum of the 3rd century B.C. and it turned out as a peculiar building. The Folklore Museum of Sikinos is housed in an old oil press and it was founded by a local. The monastery is impressive, built at the edge of a 300 meter high cliff, right over the sea, and it looks more like an impenetrable fortress. The church of Panagia Pantanassa with its blue dome is located on the main square of Kastro and it has a rare gilded woodcut temple. The Sikinos Byzantine Museum is housed in one of the few buildings of the medieval settlement that have survived, at the southwest edge of Kastro. 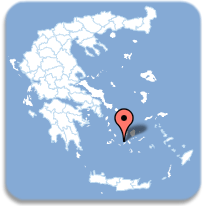 Welcome to the Sikinos page of Greece Vacation Search! 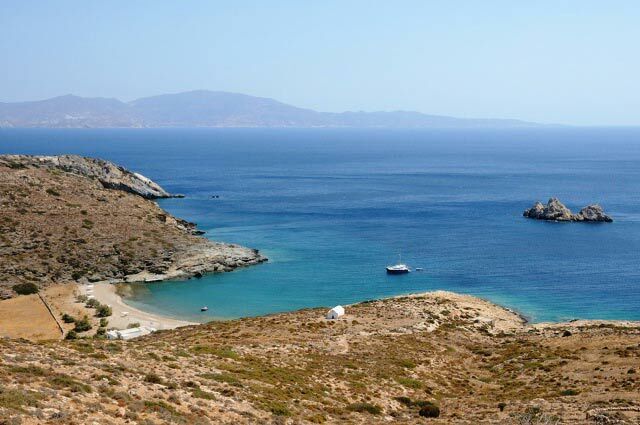 Here you will find all the information you will need for your summer vacations on Sikinos. Subscribe to our newsletter in order to receive news, offers and updates regarding the Sikinos and all the other Greek islands.